The Affordable Care Act was intended to expand the fraction of the United States population covered by health insurance. The law includes taxes on employers and various implicit taxes on employees that go into effect over the next two years. Economic theory suggests that such taxes will contract the labor market in an amount commensurate with the amount of the new taxes. 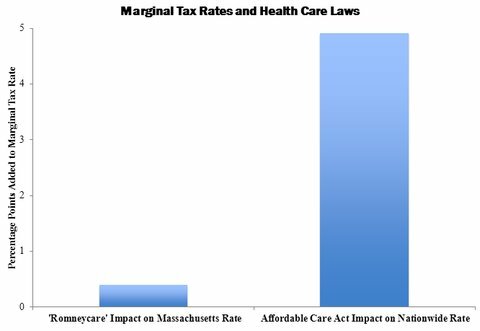 This position assumes that the Massachusetts system increased marginal labor income tax rates in the state by roughly the same magnitude that the Affordable Care Act will increase them in the United States (by marginal labor income tax rate, I mean the extra taxes paid, and subsidies forgone, as the result of working, expressed as a ratio to the total compensation from working). This assumption is no longer necessary, because the methods I have used to measure marginal tax rates from the American Recovery and Reinvestment Act of 2009, unemployment insurance expansions and the Affordable Care Act can also be applied to the Massachusetts health reform law. The results are shown in the chart below. The left bar shows that the Massachusetts law did, on average, increase marginal tax rates and thereby reduce the reward to working. But the impact was well under one percentage point, and for that reason it’s probably not surprising that, relative to other states that were not experiencing health reform, the Massachusetts labor market did not change noticeably after the law went into effect. The right bar shows the impact of the Affordable Care Act on nationwide marginal tax rates: it increases national rates about 12 times as much as the Massachusetts law increased rates. Earlier this year I explained why the Massachusetts law was so different from a tax perspective: among other things, its employer penalty is an order of magnitude less, the state’s population is not the same as the national population, and Massachusetts had already been helping unemployed people with health insurance. It follows that the effect of the Affordable Care Act on employment and work hours would be roughly 12 times as great as the effect of the Massachusetts law. That doesn’t by itself tell us the exact impact of the national law because we don’t have a precise estimate of the impact in Massachusetts, except that it was small. For example, if the Massachusetts law reduced employment by 0.1 percent, the Affordable Care Act’s effect would be roughly 1.2 percent; not small. If the Massachusetts law’s effect were 0.25 percent (still small), the Affordable Care Act’s effect would be 3 percent: again, not small. The bottom line was that it was wrong to expect the two laws to have had the same effects. Call me gloomy, but I’m one economist who thinks that adding, on average, five percentage points to marginal tax rates will noticeably depress the labor market, while adding a few tenths of a point in Massachusetts did not.